Blushing Belle packs a ton of sweet nutrients in her blushing red skin. 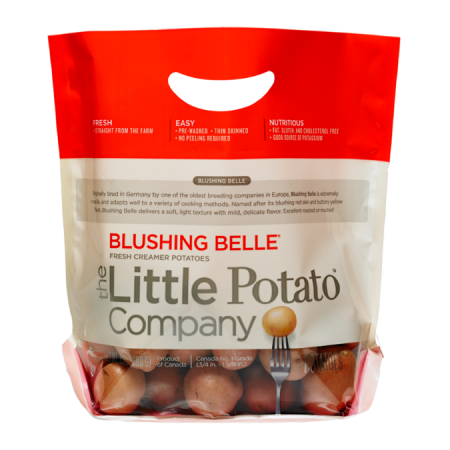 Blushing Belle is our signature red Creamer potato, originating from one of the oldest breeding farms in Europe. Blushing red skin complements the yellow center noted for its smooth, velvety texture. Balance is key with Blushing Belle, and it offers a wonderfully composed flavor profile. The thin skin is slightly sweet, an intriguing contrast to the Creamer’s otherwise earthy and vegetal taste. Tiny hints of white asparagus and artichoke are detectable. Our Blushing Belle varietal agrees with every cooking style, and is particularly excellent roasted or mashed.